Now that we are gliding along smoothly into the New Year, we wanted to take a moment to stop, reflect and share. Since we live in the most beautiful place in the world (aka – The Kenai, Alaska’s Playground), sometimes it’s easy for us to get wrapped up in our own little slice of paradise. But what we’ve noticed along the way is that our fellow Alaskan friends, colleagues and adventure-lovers have some of the best kept secrets in the great 49th state. So what’s all the hush-hush about? These 30 Instagram accounts are filled with so much phenomenal eye-candy that you won’t be able to contain your love affair with the Last Frontier. Fuel your wanderlust and fall head over heels in love with Alaska (again, and again, and again) after you follow each and every one of these insanely awesome pages. No matter where your travels take you this year, we know that you won’t regret putting The Kenai at the top of your bucket list. 1 – @JohnHallsAlaska. Check out all the behind the scenes action of these fully guided small group tours. See the best of what Alaska has to offer! 2 – @TravelAlaska. The State of Alaska Tourism Office shares incredible attractions all across the Last Frontier. You won’t be able to contain your excitement, trust us. 3 – @TheAlaskaLife. If there was ever a doubt in your mind that living in Alaska was the definition of ‘living the dream’ – this is all the proof in the puddin’ that you need. Absolutely brilliant photography and incredible stories from locals across the Last Frontier will leave you in a constant state of awe. 4 – @AlaskaTravel. Alaska Travel at Alaska.org will show you sides to Alaska that you only thought existed in your wildest dreams. 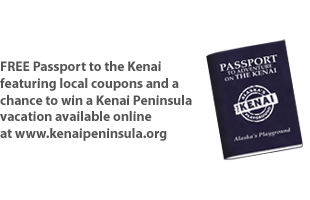 Be sure to check out the Alaska map and start making all of your Alaska dreams come true. 5 – @CabinLife_Alaska. Because sometimes it’s just good for the heart to follow the solace perspective of off-the-grid living in interior Alaska. Simply put, these snaps are food for the soul. 6 – @AlaskaUltimateSafaris. Alaska bear watching and glacier viewing is just so much cooler when you experience it from the comforts of a helicopter. This unforgettable excursion is unlike anything else in the world. See a side to the Kenai Peninsula like never before. 7 – @VisitSoldotna. Catch the latest on what life is like inside Alaska’s Kenai River City by following this great page today. The beautiful photography will make you fall in love with all four seasons on a whole new level. 8 – @KenaiFjordsNPS. Follow all the stunning latest on the renowned Harding Icefield and get up close and personal with some of the most jaw-dropping displays of raw nature and marine wildlife in the salty shores of Resurrection Bay. 9 – @VisitHomer. Alaska’s halibut fishing capital of the world is home to so many renowned treasures. Visit the Homer Spit, go fishing in Kachemak Bay or spend the afternoon chasing down phenomenal photography opportunities. Just about every nook and cranny of this town will delight your heart with joy. 10 – @AkWildlife. The Alaska Wildlife Conservation Center in Portage is such a prized gem that locals adore and visitors are continuously amazed by. Follow them today and keep up to date on what all the cutest rehabilitation animals are doing to keep strong and happy in the Last Frontier. 11 – @ResortAlyeska. Head to the most beloved ski town in the world where you’ll find the incredible Alyeska Resort. This resort offers endless powder play dates in the wintertime as well as some of the most epic hiking and backpacking destinations during the summertime. Hop on a trail or shred the pow, but if you’re stuck at home – follow all the magic on Insta. 12 – @AlaskaWildland. Uniquely, responsibly and exclusively Alaskan adventures dating all the way back to 1977. For top notch tours, lodging and backcountry adventures in the Last Frontier – you need to follow these fine folks ASAP. 13 – @JimmieJackFishing. This awesome Alaska fishing lodge is located right here on the Kenai Peninsula. Stay up to speed with what’s being caught and be sure to plan your next halibut, salmon or multi-species fishing trip today. 14 – @26glaciers. This luxury glacier viewing tour out of Prince William Sound in Whittier was voted best in the state by locals, and after you see these jaw-dropping photos you’ll completely understand why. This is a bucket list must! 15 – @AlaskaRailroad. The most beautiful train rides in the world lead you right to the Kenai Peninsula, you just have to hop on and experience the magic for yourself. This Insta page will make you seriously need to start planning your Alaskan adventures ASAP. 16 – @AlaskaCollection. Formerly Alaska Denali Travel, the Alaska Collection offers the best of the best in Alaska vacation planning options. From the Kenai Peninsula, Katmai, Lake Clark, Seward, Talkeetna, up into Denali and so much more. Just start exploring and you’re sure to stumble upon something that lights a fire in your adventurous spirit. 17 – @AlaskaBearAdventures. If adorable bear cubs roaming in the raw wilderness makes your heart absolutely explode with happiness, this page (and these tours) is exactly what you need. Head down to Homer this summer to experience the fun in person! 18 – @TravelJuneauAK. If you haven’t noticed already, our love for the Last Frontier runs deep. So deep that our neighbors in the Southeast community of Juneau have us lusting over their gorgeous outdoor wonderland. From the sights of Mendenhall Glaciers to the lush rainforest beauty inside the Tongass National Park – we can’t get enough! 19 – @KenaiRiversideFishing. There is just nothing like them summer nights spent out on the banks of the Kenai River fishing beneath the midnight sun. Mountains, river, trout, salmon – oh my! This guiding diary makes us get a major case of heart-eyes! 20 – @AlaskaMarineHighway. Visiting Alaska via the picturesque marine highway is an experience unlike any other in the world. View majestic mountains towering above you out of the ocean while the occasional breaching whale pops up to greet you on the bow. Mind-blowing? You better freakin’ believe it. Only in Alaska baby! 21 – @OrcaIslandCabins. Head to Seward and make your way out to the idyllic shores of Humpy Cove where you’ll find Orca Island Cabins. The yurt style lodging offers the most perfect ‘glamping’ experience while the eco-activities available at your disposal will charm the socks right off of you. Go whale watching via stand-up paddleboard or kayak around the bay while birding. 22 – @SeldoviaBayFerry. Life beyond the Homer Spit in the remote coastal town is just about as scenic as can be. Literally just following the Insta page will completely relax you, but we highly encourage you to take a trip on the ferry this summer and reward yourself with the ultimate Kenai Peninsula getaway. 23 – @great_alaska_adventures. Livin’ the dream never felt so good. Follow the ultimate outdoorsy adventures with Great Alaska team and find yourself flocking to The Kenai, Alaska’s Playground for fishing and travel fun. 24 – @AlaskaSealifeCenter. Scientific knowledge mixed with stunning photographs helps to promote the understanding and stewardship of Alaska’s marine ecosystems. This is not only a great (indoor) place to take the family to enjoy during the chilly winter months, but it’s also an absolutely blast any other time of year as well. Caution: cuteness overload will occur in heavy doses. 25 – @PrincessAlaskaLodges. Plan on taking a cruise up to Alaska? If so, you better start following this Insta page like right this very second. Extend your time in the Last Frontier with a land excursion package that will lead you to the most stunning Alaskan lodges in the 49th state. Trust us, the photos will do something crazy to your adventurous heart. 26 – @DiscoverValdez. Home to the snowiest area in the entire state and the most awe-inspiring views of Mother Nature. This might be one of the most wow-worthy adventure capitals in the entire state. A huge shout-out to our neighbors for continuing to share the renowned beauty of Alaska with all of us! 27 – @TurningHeadsKennel. We have a secret to share that we can no longer keep quiet about. We are freakin’ crazy-obsessed with dog mushing. It’s just the most incredible sport of pure resilience, compassion and power. To overcome such tremendous boundaries to then come together as a team, (wo)man and dog – there is nothing more admirable. This Insta account just lights a special spark in our hearts. You’ll see why after just one glance. 28 – @StillPointLodge. A sweet, sweet island escape that you’ve been dreaming about all your life. THAT, my friends – is exactly what you’ll find here. The towering fjords, majestic mountains and enchanting views of Kachemak Bay will utterly blow you away. 29 – @MillersLandingEscape. The idyllic town of Seward will lead you to a peaceful slice of paradise known as Lowell Point. The large beach area with towering mountains in the distance is like a scene straight out of a dream. Millers Landing also just so happens to be your one-stop option for lodging and recreational activities. 30 – @InletCharters. Inlet Charters Across Alaska out of Homer is who you need to be with when you want to have a blast and catch a ton of fish. Reel in halibut or salmon, or spend the afternoon on a renowned wildlife viewing tour. Whatever you do, don’t forget to follow this crew on Insta and book a trip for the 2017 season before it’s too late! Safe travels to all of our dear friends out there and remember that you can always reach out to us at any time if you need help planning your dream Kenai Peninsula vacation. There is a reason why they call our stunningly beautiful backyard The Kenai, Alaska’s Playground. No where else in the mighty last frontier will you find as many ample outdoor opportunities as you will on the Kenai Peninsula. Our majestic mountains will take you above it all and leave you with some of the most jaw-dropping views that you will ever experience in your lifetime. Our glistening glaciers are not only fascinating to look at, but they are also a blast to hike around and even camp next to. We can’t forget about the incredible amount of wildlife that roams freely from land to river and sea on the Kenai Peninsula. It’s almost impossible to visit this renowned area without a chance run in with bears, moose, eagles, whales, caribou, seals, otters and truly so much more. As January is now in full swing, we imagine that you’re probably starting to think about where your summer travels will take you in 2017. Before you go any further, we want to tell you that there is absolutely no other place in the world that you should put on your list above a visit to The Kenai, Alaska’s Playground. Not only does this prominent and popular area have an unlimited amount of outdoor activities for you to enjoy, but there are also a ton of laid back excursions that visitors can embark on if they want to relax and have a less strenuous vacation. Best of all? Just about any itinerary throughout the State of Alaska can easily be combined with a trip to the Kenai Peninsula. So whether you’re coming up to the 49th state via cruise ship, hopping on the Alaska Railroad or just renting an RV and ‘going with the flow’ – you’ll find all the magic you need to fuel your wanderlust for life. Not convinced? Be sure to check out these 10 awesome adventure videos and we are sure that your mind will quickly be changed. 1 – This fly fishing video throughout the Kenai Peninsula will have you itching to flip for reds and spend your summer nights dancing beneath the midnight sun with your closest friends. 2 – Free and foggy! This fun traveling ‘van life’ video proves that the Kenai Peninsula is effortlessly beautiful, even when it’s foggy and rainy outside. There is no denying that hiking up to Exit Glacier in the Kenai Fjords National Park is a magical experience, even when the skies aren’t blue. 3 – If you’re coming up to the last frontier to experience as much of the state as possible, you’ll love this father/son video that shows them traveling via RV and stopping in places such as Anchorage, Seward, Valdez, Tok, Fairbanks, Denali National Park & Preserve, Fairbanks and many others along the way. Talk about the best family bonding idea ever! 4 – It’s hard to hide the excitement that comes along with rainbow trout fishing on the Kenai River. Can you say HOG WILD? Yeah baby! 5 – If you thought that the Kenai Fjords National Park out of Seward was an incredible place before, you’ll be completely mind-blown after watching this phenomenal aerial footage. Alaska, take me away! 6 – Alaska’s ‘halibut fishing capital of the world’ from above… WOW! We are speechless. The perspective of the docks is truly brilliant. Not to mention, the drone footage capturing Dall sheep running wild across the rocky cliff faces in Seward is a complete masterpiece moment. 7 – This light and breezy video fills our hearts with summertime nostalgia. Nothing beats the joy that comes along with reeling in a salmon, steelhead or rainbow trout on the world-famous Kenai River or the less known Anchor River. Now we are ready for a night spent laughing around the campfire. 8 – This drone footage coupled with a perfectly peaceful melody captures the essence of fall on The Kenai beautifully. We love our sweet small town life and the unbelievable amounts of raw nature that surrounds us from land to sea. On another note, we could sunset gaze over Cook Inlet for a million years and never get tired of it. 9 – What stands out to us about this great footage is how ‘easily accessible’ such wonderful sights can be on the peninsula. A simple drive through town can present adorable wildlife viewing opportunities right before your very eyes (those wobbly little baby moose- aww! ), whereas a sweet stroll down the docks in Seward or Homer might just mean that you get to observe otters swimming around right beneath your feet. 10 – We will finish up our list with this excellent Alaska-wide video that shows not only how beautiful places like Seward, Homer and the Kenai Fjords National Park are, but also outlying attractions such as Denali National Park, Katmai National Park, Talkeetna, Hatcher Pass and more. If you were unsure about visiting Alaska, this will change your mind in an instant. Safe travels out there, adventure hounds! If you ever need any tips or tidbits along the way, always feel free to reach out to us directly and we will be happy to help you plan the most epic vacation of your lifetime. Wintertime on The Kenai, Alaska’s Playground is known as being the regions ‘best kept secret’. In a land that is so highly raved about and visited during the summer months, wintertime stands out for many special reasons. This season offers a delicate balance of breathtaking beauty and outdoor activities without the hustle and bustle of high volume tourism traffic. One of our go-to destinations during the winter months is a good frozen lake with sparkling fresh powder lining the sides in serene fashion. These lakes offer a variety of outdoor activities including cross country skiing, ice fishing, sledding, snowmachining, snow shoeing, ice skating and so much more. Read on to see a handful of great lake options that are guaranteed to take your winter wonderland adventures up a notch! 1 – Scout Lake. Located just outside of Soldotna, this wonderful neighborhood lake offers excellent opportunities to ice fish for landlocked cohos. You’ll love the convenient road access and the proximity to town. 2 – Juneau Lake. Snowshoe or cross country ski to the Juneau Lake Cabin on the south end of the Resurrection Pass Trail and find yourself submerged in a peaceful paradise with only the sounds of nature in the distance. Ice fishing for burbot is also excellent here around January. 3 – Tern Lake. The turnoff on the Sterling Highway when you can turn right to go to Seward or left to go to Anchorage offers a great place to go ice skating with the family once the lake freezes. The mountain views that surround you will completely refresh and revive your soul. 4 – Carter Lake. This moderately traveled trail nearest to the town of Moose Pass is an excellent place to enjoy snowshoeing and cross country skiing. You’ll fall in love with the beauty of the backcountry here, there is no doubt about that! 5 – Watson Lake. This is a small campground located on the Kenai Peninsula located at mile marker 71 off the Sterling Highway. This is a great place to take a winter walk in the woods, go ice fishing or snowshoeing. 6 – Skilak Lake. Getting to the Kenai River can be a bit challenging during the winter months, but it can be done! Where there is a will, there is a way! Extreme outdoorsmen and woman can be found venturing across this frozen wonderland during the winter months and the sights in the distance are absolutely EPIC. Not the mention, the fishing this time of year is some of the best! 7 – Longmere Lake. Located at Mile Marker 88.9 off the Sterling Highway, this stocked lake makes it a perfect winter wonderland ice fishing destination for the whole family. 8 – Fish Lake. Drive down Swanson River Road and find yourself in an outdoor recreation mecca land. Whether you are hunting, ice fishing, ice skating or anything in between – you are sure to be spoiled with beautiful sights and peaceful sounds of nature. 9 – Kenai Lake. One of the most magical destinations in Cooper Landing is by far Kenai Lake. During the winter months this special place is an excellent spot for wildlife viewing, photography and so much more. 10 – Arc Lake. Located just outside of city limits in Soldotna, this is an excellent place to bring the family and enjoy a day of ice skating, ice hockey, ice fishing or just let the dogs run around and take a walk around the lake. 11 – Crescent Lake. If extremely remote and secluded is what you’re after, you’ll love this lake. Stay in a public use cabin after spending the day snowmachining through the mountains to reach this magical destination. 12 – Spirit Lake. Located off of the Kenai Spur Highways and Strawberry Road in Kenai, this lake is great for ice fishing. Reel in species such as arctic char, coho and rainbow trout. This is great fun for the whole family! 13 – Engineer Lake. Tucked in the foothills north of Skilak Lake, this hideaway destination a great place to escape the rat race and revive your soul. Stay in a public use cabin and enjoy some of the best wildlife viewing on the Kenai Peninsula. Need more recommendations? Be sure to let us know if we can help you plan your adventure… we are always here to help you have fun on The Kenai! Whether you’re coming to The Kenai, Alaska’s Playground for fishing, wildlife viewing, sightseeing or anything and everything in between – you are sure to get a good nights sleep when you rest your head at one of these inviting hospitality outfits. Listed in no particular order, each and every one of these charming bed and breakfasts will captivate your heart and make you feel right at home. These places are truly just the best of the best on the Kenai Peninsula! 1 – Buckman Bed & Breakfast of Alaska – Soldotna. 350 feet of private Kenai River frontage plus a comfortable room and a continental breakfast each morning. If seclusion and privacy is what you’re after, you’ll love this unique and picturesque place. 2 –Timber Bay Bed & Breakfast – Homer. This place is a true hidden gem in the ‘halibut fishing capital of the world’. Drive 15 miles out East End Road and enjoy panoramic views of the bay and the mountains in the distance. Your chances of seeing wildlife are also very high here! 3 – Tanglewood Bed & Breakfast – Kenai. With an unassuming feel from the outside, you’ll be totally blown away by the wildlife views overlooking the tidal flats. Enjoy watching moose, caribou, seals and bald eagles in the distance as you enjoy breakfast at your leisure. Bonus: this great place is just two miles from all the great shops and eateries in downtown Kenai. Location, location, location! 4 – Alaska Paddle Inn – Seward. With private rooms overlooking breathtaking views of Resurrection Bay, you won’t ever want to leave these rustic and adorable accommodations. Enjoy neighborhood attractions such as hiking, kayaking, beach combing, wildlife viewing and truly so much more. 5 – The Moose Is Inn – Clam Gulch. This family owned and operated B&B is just 20 minutes from the Kenai River action and conveniently located to some of the best halibut fishing in the state. Many visitors also enjoy wildlife viewing and beach combing close by. 6 – Alaska Fishing Charters and Soldotna B&B Lodge – Soldotna. Nestled on the banks of the world famous Kenai River, you won’t ever want to leave once checking in and meeting your gracious hosts. Combine your cozy staycation with an epic fishing charter and find yourself living the perfect Alaskan dream. 7 – Escape For Two B&B and Cabin Rentals – Soldotna. It’s impossible not to fall in love with this charming place tucked away in the quiet Soldotna woods. The lake view will make you feel peaceful and relaxed while the fireplace on the open deck will make you really escape into a staycation paradise. 8 – The Spyglass Inn – Homer. Pat is simply one of the most incredible hosts in the last frontier. Come and stay in this cozy home away from home and enjoy activities nearby including fishing, hiking, wildlife viewing, shopping, beach combing or checking out the local eateries. 9 – Red Cabin B&B – Kenai. Located on 20 private acres and yet just five minutes away from the world famous Kenai River. If you are looking for the best of both worlds (i.e. – action and relaxation), you’ll definitely find it here. Plus the hosts are absolutely incredible! 10 – The Hutch B&B – Cooper Landing. If you’ve never visited the charming town of Cooper Landing, you will absolutely fall in love with it after a visit here. We love the ‘down home’ atmosphere that you’ll find here and the very reasonable rates. Not to mention, you’re just minutes away from the prolific Kenai and Russian Rivers. 11 – The Farm B&B – Seward. Quaint, quiet and reasonably priced. When you come to the farm, you’ll undoubtedly be able to get some much need rest and relaxation. This historic place was originally built in the 1920’s and when you see the way it has transformed over the years, you’ll be in awe. This place is so special! 12 – Grouchy Old Woman B&B – Nikiski. 20 scenic minutes north of the popular town of Kenai is this charming B&B on the shores of Daniel’s Lake. This calming spot is great for groups of 10 or fewer and those who enjoy soaking in splendid views of nature and wildlife. You’re sure to be impressed by the local garden and towering trees that surround you. 13 – Halcyon Heights B&B/Inn – Homer. With truly epic panoramic views of Grewingk Glacier, Kachemak Bay and the Homer Spit, it’s safe to say that your jaw will drop when you pull up here and are instantly made to feel like you are on top of the world. Enjoy just a handful of minutes from downtown, free internet, hot tub, large decks and private bathrooms. This is Alaska at it’s finest, folks – and you’ll love every second of it! 14 –Daniels Lake Lodge – Nikiski. The secluded lakeside cove is enough to charm the socks off just about anyone and everyone. I mean, you’ll probably never want to leave. Enjoy wildlife viewing, private rooms, a lakeside hot tub, canoe rides and truly so much more. If you need any more great recommendations for places to stay or things to do on The Kenai, Alaska’s Playground, be sure to let us know in the comments below or send us a private message. Have fun out there, travel warriors!